Sony Officially Announces NR Series in U.S.
Sony has just announced that the PEG-NR70 and PEG-NR70V will be released in the U.S. in early May. The NR70 will cost $500 while the NR70V will be $600. Sony will begin taking pre-orders on SonyStyle, its webstore, today. In a departure from its previous policies, the U.S. versions will have the same names as the Japanese ones. For the benefit of those who have recently been living in caves, the NR series was announced just over two weeks ago in Japan. It includes a 320 by 480, 16-bit color screen that has virtual Graffiti. It also has a clam-shell design, a built-in keyboard, 16 MB of RAM and is the first Palm OS model to use the 66 MHz Dragonball Super VZ. In addition, the NR70V has a built-in digital camera. Both member of the NR series run Palm OS 4.1. They have 8 MB of flash ROM. They also include a DSP chip that allows them to play MP3 audio files. They come with the same audio and video control wand from the N760C plus ear bud headphones. The screen can be turned off while playing music. Because they use a separate DSP, the user can listen to music while using other applications. It has the enhanced speaker from Sony's T-series. The NR series can actually play MP3s and other audio clips through this speaker, though a bit quietly. Probably the most unique feature of the NR series is its ability to take on three different shapes. 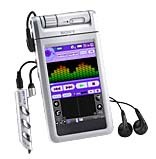 It starts off in a closed position, which protects the screen but still allows the user to listen to music. When first opened, the keyboard and hardware buttons are on one side and the screen takes up the other. The screen can be rotated 180 degrees then folded down to cover the keyboard. In this tablet mode, the user enters text with Graffiti. The hardware buttons are hidden inside the machine so the virtual Graffiti area has digital versions. The backlit TFT screen is 3.8 inches tall. When closed, both of these models are 5.5 by 2.9 by .69 inches. They weigh 7 ounces, including the stylus. They have a magnesium casing. The NR series has all of the components typically on a Sony handheld, like a Jog Dial and a Memory Stick Slot. They don't actually come with a Memory Stick, though. These models have the enhanced IR port from the T series. They have other things in common with the T series, including the same stylus and HotSync port. This means the NR series can use many of the same peripherals designed for the T series. Because the hinge is at the top, the stylus slot is on the bottom. Rubber has been added to it to prevent the problem the T series has with the stylus easily slipping out. They run off an internal Li-Ion battery. The company might be a bit sensitive about the battery life on this model because the official release mentions nothing about it. The company says the Japanese versions will run for 10 days, if the handheld is used for a half hour a day. The company may have been dropping some hints, though, when it brought up a battery charger and a car charger in the announcement. The camera on the NR70V can take pictures at 320 by 240, 160 by 120, or 88 by 88 pixels. The lens rotates 300 degrees to allow pictures to be taken from different directions. Images can be saved to RAM or directly to a Memory Stick. In addition to software necessary to use the audio player, enhanced infrared port, and camera, they come with Documents To Go 4.0 Standard Edition to allow the user to access Microsoft Office files. Of course, they also have gMovie for playing videos and PG Pocket for showing images. Sony has not yet added support for the Mac OS or Linux. All the desktop apps supplied are for Microsoft Windows. The NR series will become Sony's flagship handhelds, replacing the N760C, which Sony no longer has available. Didn't sony learn from Palm about pre-ordering? Sony has always gave pre-orders on all of their pdas, and we haven't heard a single bad news article about it. 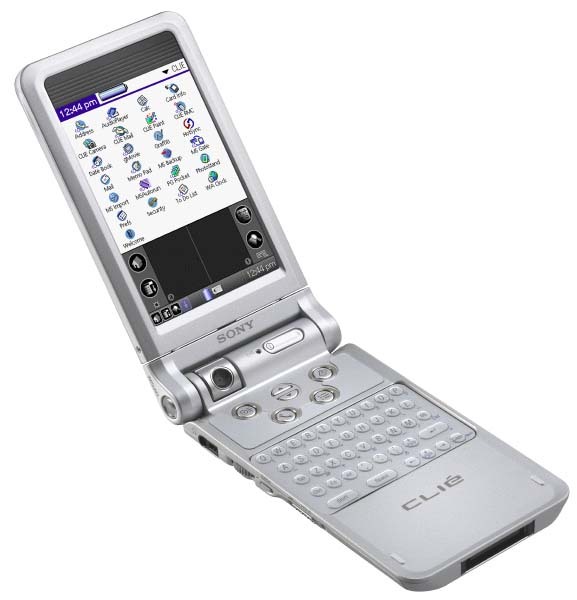 When they first released the N710C in the States, they only had a few products in hand. However, they didn't ship the PDAs to those that pre-ordered first, in stead, they ship those to Staples, BB, and stuffs. Some of the pre-orderers tried to cancel the order, but because of their 'complicated processing system,' their orders weren't canceled, and they have to spend $100 for shipment return / re-stocking fee. most countries allow you to purchase things from other countries... I believe you can do this with use of the mail in most places... sometimes the total cost is less... good luck! Amen, there were a LOT of problems with the preordering in the past. Sony's cancellation policy is a joke, I think they just don't have one. So you will not be too happy when you pre-order and don't get your device right away, and the local Best Buy gets them instead. I have to get a Gameboy to get my thumbs built up for all of that typing that I'll be doing on my new NR70. What's up with $ony? US version is 100 USD more than Japanese version. I don't know if this accounts for all of the price increase but it costs more to ship something a third of the way around the planet than it does to ship it down the street. These are too hot an item to go by cargo ship. I'll bet you every one of these has been flown here. Don't just blame Sony! Other Palm/Handspring devices are also cheaper in Japan and other part of Asia. The Palm M100 was selling as low as $40 in Japan at some point. Actually, with the Yen as low as it is against the dollar, I don't think shipping would affect it that much. Several US industries have said that the Japaneese government have been keeping the yen low to make their products cheaper in the US. But looking at the price, this isn't one of them. PDAs are cheaper in Asia may be because they are produced in Asia? Its simpler than all the reasons listed above. It is $100 more because of marketing. We pay $100 more because we will. They have to pay a lot of import tax. It's the US who charged to much of tax for a product to get in here. Asia country don't charge them as much. US is charging high import tax for a reason, to keep US companies alive. If every Sony product is $100 cheaper, who is going to buy palm and handspring??? maybe the continuing recession in Japan and general economic softness in Asia has something to do with the pricing. The US economy is seen to be on the mend, so perhaps sony thinks the US marketplace can support the 100 dollar price difference. Maybe the folks at Sony have been reading PIC. Seems to me that there has been no shortage of fools here salivating to throw away $600 on a handheld computer. When it all shakes out, and those with money to burn have finished slobbering all over the display cases at Circuit City, the price of these new Clies will be more in line with what a more sensible Japanese consumer is willing to pay at the onset. Don't forget that a dollar means different things in different parts of even the US too. You can get a nice apartment in some parts of the country for $400 a month, but try looking for housing in New York City or Silicon Valley. Think yourself lucky you don't live in the UK.. The price will be the same in GBP as it is in US Dollars - work it out - UK gets shafted on prices for EVERYTHING. For those people who said Asian countries charge less, it simply isn't true. Hong Kong charge 3280, or 420 with Chinese OS for T615c. We all know that the Chinese OS is about 10-20 dollars in bulk order os the price comes to 400. In Japan most stores sells T615C for 40,000 Yen, or 304 dollars. So, not the U.S. government, not cheap cost in Asian, just that Sony decides to charge more in area outside of Japan. >> We will pay for the extra USD100. In Japan, the major PDA leader is Sharp. So they lower the price in Japan to attract the gadget lovers. For myself in HK, we pay roughly the same as those in USA, USD100 more than in Japan domestics price. "We pay $100 more because we will." 1. We consumers have the money. 2. We will most likely pay for what we want without any fuss. But in other countries you can buy stuff such as ice cream for only 10 cents! (in american money). I suppose Sony knows that it wont greatly effect us by settiing a higher price since the high-end pda's have reached over 400.00usd. Same here in Hong Kong. I paid a little over usd400 for a T615C from Sonystyle. The T600 (Jap. version) is only usd300 here with store-only warranty. Since the Sony product cycle is so short, next time I will just buy the Jap. version. Sounds like $ONY is simply subsidizing the cheap prices at home with our $$. If you gotta have one of these, then $100 isn't going to stop you. I'll wait until the OS5 x-scale comes out 2 weeks after this is released and then see if the price drops by about.... a $100. In europe it will be MORE than 100 US difference!! Protect your LCD screen from scratches with the long lasting, reusable and ultra-thin Screen Protector. Easy to apply and remove. Extend the running time of your CLIÉ handheld with the Battery Adapter. This lightweight Battery Adapter uses four AA-size batteries*, which can fully charge a CLIÉ handheld. A perfect back-up when you're traveling. Compatible with: PEG-NR and PEG-T series. Hmmm ... yes, some kind of screen protector would be a must if you are going to use this thing as a PDA-like device instead of the mini-laptop that it is. I think your "mini-laptop" phrase is very perceptive. Sony has released a number of VAIO laptops in the past that sought to push the small-size envelope. I suspect you're right in suggesting that they intend this to be part-PDA, part-superminilaptop. That would certainly explain the pricing. Sony already had a mini laptop, not too much bigger than this with a built in camera. Anyhow, my point was that many people were claiming that you could just keep this in the form with the screen exposed and it would be just like a normal PDA. While that is true, with the keyboard folded away, it then offers you no protection for the screen. RE: 8 Megs Flash.. wow..
As far as I know, the MP3 files will be on the MS and since it is solid state storge medium, there is no need for buffer (well, a little bit buffer may be needed for the MP3 decoding software to run). Besides, are ROMs too slow to be used as buffer? Yeah, from the experience of someone who has self-upgraded Clies and Palms, and a frequent user of programs like JackFlash and BackupBuddy, that particular internal Flash ROM is too slow at WRITING to be used as an MP3 buffer. A proper buffer needs to be super fast at reading and writing so that the music doesn't skip. It would take ages to create the buffer, though it could read from it pretty quickly. Could the built in apps have anything to do with this high ROM value? What of the higher res would it need more rom to support this? Or maybe it will be os5 upgradable??? LG, I don't think it will be able to run OS5, because OS5 will be used in future PDA's with ARM chips. The new sony clie models listed on this article are not ARM chip powered devices. in the comparison table of models. I still think it is interesting that it didn't get mentioned in the release that Sony sent to the press.